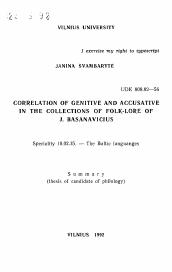 Correlation of genitive and accusative in the collections of folklore of J.Basanavicius - автореферат и диссертация по филологии. Скачать бесплатно полный текст автореферата диссертации на тему Балтийские языки. Полный текст автореферата диссертации по теме "Correlation of genitive and accusative in the collections of folklore of J.Basanavicius"
Sumr-ary was sent on	th ^ljtjl&> 1992. Much attention has been paid by ir-'estigators of syntax of the iithuanian languange to word combinations. Vol. 3 of the Academical Grammar of the LithuaniSUV l*anguange (V., 1976) mainly focuses its attention oa word combinations too Problematic aspects of word combinations have boen touched upon in the works by B. Kalinauskaa (Syntax of Word Combinations in lithuanian. V,, 1972) and V. Labutis (Problemtic Aspects of Word Combinations, V,, 1976). Several theses of candidate of philology dealt with certain types of word corabi^fltion3 in Standard lithuani^-i, theee are the one by A, flasimaricius (1965), £. Grenda (1968), K. Cgiicauskaf (1958). V't thesis of doctor of philology by L, Valeika j.s worth mentioning here too. A great number of articles on different aspects 'Vf word combinations has been written and published during the last decades. combinations (which some times were turned, in different ways) have deep traditions in Lithuanian linguistics. '....!. the (Jenitive and the Accusative used synonymously. Sf we presented a verbal phrase which could be used either with the ^enitive or with the Accusative of a part, .here would be a discussion between our linguists on the regularity of the phrase, for they already discussed on the use of the ^Gtive with the infinitive 30 years ago. The problem wasn't solved then, thus, studies of word combinations or tfc»uee of the caaea in theoretical terms and especiu.ly in the terras of langutmge normalization ore atill urgent. We have с osen one particular problem for ou. thesis -ве a' ed nt analysing verbal phrases which can be used with tie Accusative as well as the ueuitive, comparing the two variants of the phrase in the definite text - the collections Lithuanian narrative follc-l^re coraplled and published by J. ^aeanRvioius. duration, cnntiinuity and completion of the action expressed by a verb and other criteria. with a negative transitive verb and its compound form. how it accounts for the case form of an object. 4. To explain the usage of the Accusative of'a direct object with the gioup of verbs which, according to the standards of modern Lithuanian,. require the Genitive. 1. To analyse word combinations withe the Genitive or Ik* Accusative used to expresa the whole and indefinite _ .quantity, the adverbial modifi*"'" of purpose, the object with a negative transitive verb and a direct object, and to mnka use of the theories on similar phenomena in Lettish, Russian, Polish and other languages. 3. lo find out whether the standard of the use of the Genitive and the Accusative- in verbal pK: >ses is based on the lan^-ange of folk-lore or on the variants of colloquial lan-guange. of the catalogue of the problems we axe interested in. statistically (which doesn't mean at all that we insist on their rejection). closenesa if the usage of the Genitive and the Accusative ¡f<\g. the Genitive of a part / the Genitive and tho Genitive of a direct object and the Genic_ve of purpose). The study of the problem of the usa of the ^enitive with compound verbal predicate formed by means of the verb "nor6-ti" and the transitive infinitive which hasn't been yet dealt by our linguists should be considered to contribute to the novelty of the ..ork too. Besides, one should bear.- in mind tiiat our material and its analysis present wider approach to|wards the problem of the cboise of the variant of a word combination by speaker which is determined by many criteria. standardised villi be quite a new one for syntas studies. Our aspiration to achieve the tasks ond thejains of the work in the most efficient way accounts for the choiso of tha methods of investigation. VJe've cade complex use of the traditional methods in the studies of syntax - descriptive and din-chronical methods: first c ell these are the Grammatical and semantic analysis of the components of constructions and their substitution. In some enso, when wo ff&nt the things to be evident, w» use the statistical method. and the Accusative used to express the tuning of the whole and Indefinite quantity, purpose, direct object, an object with a negative transitive verb in verbal phrases, will considerably enlarge the collection of data on the problem. On the other hand these facts should encourage linguists to make a deeper insight into the problem or the use of the Genitive and the Accusative, and especially into'their motivation of the usage of these cases, when approached from tha point of view of historical syntax and syntax of dialects. Besides, the examples collected will enable linguists to continue the analysis of the use of the Genitive and the Accusative, Abundant ezarapleB will help specialists of languange normalization to foresee variations of tha norm r f case forms in .word comMigp-tions and all the possible changes of the norm.-We hope that our work will encourage linguists to study the relationship of other cases (e.g., the liominative // the Instrumental, the Uati-ve f1 the Accusative, the Accusative // the Instruroental etc.) In the languange. Ihe thesis has been considered at the meeting of the depart-dentoof Lithuanian languange of Vilnius University in April, 1992.
thesis consists of the foreword, the introduction, 4 parts, the conclusions, the list of literature usea and the list of abbreviations. The foreword defines the problem chosen and its urgency, aims of the work, the methods used and the sources us i, discusses the theoretical and practical value of the thesis. expressions, is possible, e. g. : gavo darb$ - darbo; ima pini-gus - pinigij; klausia tévq - tf^o. Ihus, verbal phrases can be analysed from two points of' view: according to the form of subordination of the. word governed and from the point-of view of semantics. While describing word combinations in the first case we stress their morphological 'f.dc, we morphologize syntax in a nay. Then we arc concerned with the case form of a word governed. Such an approval is characteristic of the Ac-vdenieal ^ramriar of the Lithuanian languange ('J7Û) and works of soma scholars (*. of out Investigation similar syntactic constructions, tha syntactic synonym®., for they stand instead of different^ cases and it seems .. . that common points between the cases exist, where two or even more c&lss could be used. tion of syntax and to reveal syntactic synonyms . expresced by different cases. In our thesis word combinations governed by verb with a subordinated component expressed by the Genitive and the Accusative are disinguished according to the foliowing meanings: a part t-nd the whole, an object with a neeative transitive verb, purpose ariQ a dixuct object with sone verbs of state and action. The expression of these relations in Btill problematic because of linguistic causes which hasn't been investigated yet as well as ouiside influence on the lancuange. Having chosen one source -the collections of narrative folk-lore compiled by J. Basanavi-ilue, we aimed ..t revealing syntactic synonyms wi . i the Genitive Accusative and expressing our opinion on themi Syntactic variant!» are the main irovinc force of the richness, variety and development of the Ifnjuange. Ihero's one more aspect which en-courftgsd uo to investigate 'hese phenomena - the aspect of nor-calitrtlor,. Ihe theoio shows, how languange norms can bo based on tha lir^uiftic facta of tha end of the 19th century and ths beginning of the 20 th ccntu.-y. We analyse the examples with verbs that govern Qenitives of indefinite quantity and Accusatives of the whole, picked out from the collections by J. BasamviSius in the first pafct of our thesis. The ability of verbs to govern the Genitive of indefinite quantity and the Accusative of the whole is characteristic oj.' other languanges as well. The survey of literature on the subject presented indicates, that such phenomena are characteristic of Lettish, Russian, Polish and other Indoeuropean languanges, though government isn't so strong as in Lithuanian there. Actually, government In the languanges mentioned can be viewed aa reliots of the ancient system. Nevertheless, scholars engaged in the studies of those languanges have revealed interesting aspects, which determine the .sage of these cages. It should be mentioned that nobody has succeeded In determinating the relationship between the Genitive of a part and Accusative, though all works on the subject have been of great interest and help for us. On the basis of the observations of Lithuanian linguists O and scholars engaged in the studies of other languanges the thesis states that tile use of the two cases Is characteristic of only a small p^rt of verbs. "« have the most evident and often cases of the ^enitive of a part with verfcg. of possesion (t^-rSti, gauti, duofci...), with verbs denoting work processes (daryti, nesti, Icepti, virti, sSti...), Cases of the ''enitlve of a part with verbs denoting mental abilities (raoj^i, iUn&tl), certain 3tate (nor^ti, trr'jti) nnd verbs having other mannings Cpnn oti, zndfeti) are rarft. re of the whole Instead of the Genitive of a part Is very often. some causes account for the use of thitr form. first of all, an object is express by means of the Genitive of abstract nouns, which indicate, that it ia understood as the whole, e. g.s kad turi nor^i aikj rasioi kur darb^f g--vo ten duonqj gavo laIvEl, turi dz^laugfiffi^f davé maia_tij. Sometimes the completion of an action isn't expressed by morphological means. In such cases the context imp? es it, e. g.i Xietuvininkai mirusiajsm tlk kurpea ir StriuinjtsfpirKavo -- nuo aavo dre z4 uz treciok% Jknyjjji^ pirkdavoj jr'-ju tik rasma pini -us, tai tiek anas mum regés - diedas uzdraude savo bobai, kad niekam neoakytn, kad [jinigii rado$ akini/.kai turèâavo alt-■rarus - dukter|( lurèjoj eodina zolynus - eodinjs bulviiu nesa grCdua - noeè dovannj géré vleoklus gftrii.-.ue - v^no gérêj verda kO££etus - kukull\j verdii) ragavo vnialua - raguujn lacinln. person, knows the quantity of an object, e. g. i duos didellua skarbuB| Zyatus mafflkin^lius atneadavo( tas zoles rasij didellua gjrlmus lr valglus atnesSj Ima tjoos^bl^nus| gavo nora siokius toklus lopua. ■Examples with the Accusative and the Genitive , expressing the whole and indefinite quantity in the oompound verbjijjonst-ructions are discussed at the end of the l^t part of the work, e. g.s norijo pirkti audlnlu - norfejo duonat§ valgytij ¿mi neat skrjlius r klaualnions - pradSJo Jduoti vlaoklH aliej^ ir zo-liiil turi rugiua pasit - turiu pagaut 2uvn. Means of expression of the whole and indefinite quantity depend upon many criteria ar.d especially on the duration, con-ti: uity and completion of the action expressed by a verb. Part 2, It is well-known, that in Standard Lithuanian negative transitive verb requires the Genitibe instead of the Accusative, thus, this part of the thesis is concerned with«." the problem of the usage of the Genitive of negation in the collections of narrative folk-lore by J. ^asanavicius. Besides, the interchange of the two csseii in such position isn't specific to the Lithuanian languanga only, though there are very few studies on the problem in other lanjuanges, except Tor the Buselan languange. 2>ns, wo had to rely on Lithuanian material only. First of all, the thesis discusses the usage of Genitives, and Accusatives with negative forms of cransitive verba - both finite and infinite. Iher^' are more than seven hundreds of examples of this kind with Accusative and onlj seventy with Genitive in the collections of folk-lore by J. ^as.'inaviSiuo. The statistical data are not exact, though they are evident and convincing enough to state that constructions of Genitiv« with negative transitive verbs dominate. darbp neturdjo. Aocusative of an object preceeding negotiation prevails. made special study of the examples with the Accusative and the Genitive succeeding negative verb, e. g.s negavo zlni%; neisvirel pi_etuaj nemusk jautj. ; nepaimsi aitij. pi-nig^. It should be mentioned, that Accusative is preferential In such cases. girl<i, n^lesusaldysi. V/e discussed such cases separately, emphasizing the tendency to use Accusative. Genitive or the Accusative, e. g.s netenka taDvargaas skatilPi; nerandu cia sau jaunikij neturi ant_Jco^ij. tas karpa3. The Accusative prevails in this position too. V/e devoted special part of the thesis to the cases of the Accusative or the Genitive with a compound verbal predicate. Scholars are not unanimous about the usage of the cases in such combinations in Standard Lithuanian. J. Jablonskis and his successors insicted upon the usage of the Genitive with a negative compound ver> 1 predicate and transitive infinitive. Though "K'llbon p. ;:tllcos pa tnrirnal" (2 nl. ed., p. 7B), having taken into account the or-'nions of different linguists, states that both vr.rinnts fire possible in ouch situation. tion Is expressed by the Genitive or the Accusative with the infinitive (supine), it appeared that there were over 500 examples with the Accusative and over 200 examples withi; the Genitive. At the end of the Part 3 we conclude that in our sources the adverbial, modifier of purpose is a expressed not only by means of the Genitive, but by the Accusative with the infinitive (supine) too. In Part 4 of our thesis we aimed at finding out how objects expressed by the Genitive and the Accusative and directly governed by the same verb are used synonymously. First of all, the typical verbs, which require the Genitive, and denote a csrf^tjin state (laukti, sulaukti) are discussed . The thesis presents a lot of examples where the verbs mentioned are used with the Genitive, as well as with the Accusative, o. g.: 1иикё krik3to t6vq> sulaukS patogiq^dukterj. A special study la made of the verbs of action prasytl, melsti, reikalauti, klausinStl, klauati. The action expressed by these verbs can be directed to a cer&y.n person or things representing aim (they are usually expressed by nouns or pronouns). Standard Lithuanian recommends the Accusative in such cases (ргазё tftvq, and in Russian prosit1 u otca), though the Genitive is tolerated too (ргаЗё t6vo, kad leist-ц pirkti arkl}.). The examples 'idicate that in most cases in the collections by J. Basanavicius the Accusative is used, e. g.i klausin^ja dvari£kiusj meldd 1д_2топси klausft bobfii ргаоё sener}.. In general, it should be mentioned, that preference is given to the Accusative in moot cases and the Ce-nitive i3 very rare. here, though there are some examples with the Accusative in the folk-lore collections, e. g. : buck}. prasSf meldS ziedjj prases puok^i kunigq reikalavo. Part 4 ends with the conclusion that certain verbs of state and acti n., according to Standard Lithuanian, require the Genitive, though in the collections by J. i,a -anavioius the Accusative is given preference in such case3. I. In the collections of narrative folk-lore of the end of the 19 th centur y - the beginniu^ of the 20. th •• century, compiled and published b;r J. Basanavicius, a pert and the whole with certain verbs of possesion, excange,,work processes; mental activities and others are expressed by the Genitive of indefinite quantity as well as by the Accusative. 1. When an object is expressed by an abstract, noun only the Accusative is possible. !he Accusative t emphasizes the integrity of an action. 2. Ihe case of object in verbal phrases expressed by concrete nouns or pronouns depends not only on the meaning of di- © visibility of a subordinated word, its category of number, but on the category of aspect of a verbj there's a tendency to use the Accusative when a verb expresses action'in continuity, and the Genitive of indefinite quantity is preferred when a verb expresses a single, completed action, when indicated by morphological means (prefixes) or having no morphological expression. 3. In some cases the Genitive of indefinite quantity can be replaced by the Accusative with an attribute which indicates that a spea' r knows the quantity of an object discussed. 4. Indefinite quantity and the whole with a compound verbal predicate with a n.od'.l or	phusal link verb expressed much like with a ninple form of a predicate, though there are c'iflcs when the infinitive requires the Acnurative. with the link: verb "norSti" and its synonyms trckati, geistl can be determined by the link verb norSti. Then it is expressed by the Genitive. It can depend on the infinitive which requires the Accusative. there's no close relationship between''case form and a verb (with word! and even sentences in between the two elements). In all cases with a negative compound verbal predicate the Accusative prevails. It is used in all the positions (pre, poet and inter positions). 1. irom the collecions of folk-lore by J. BasanaviSius one can judge that the practice of expressing purpose by means of the Accusative succeeding verbs of motion is due to the rule formulations by J. Jablonskis: If the single Genitive in post position with verbs of motion isn't possible, the Accusative with the infinitive (supine) la uaed. Such examples can be found in the areas of Uznemund, Uazoji T.ietuva, in Blrzai, 3lsu-11a1, Kidainiai, Zarasal regions. by the Genitive as well as the Accusative. 1. Kaip reiékiame neapibrégt^ kiekt in visumq. - ttiratojl knlba. - 1998. H. 3. P. 18-19. 2. Papildinysj neapibrézto klekio kilmininkas ar gallnin-kas? - 3ciltistica. 1992 (to be published). 3. Heapibréztc kiefcio ir visumos raiSka kalboje. - Dialogal. 1992 (to be published).